Hi, I am PJ, Prashanjit Bhattacharjee. 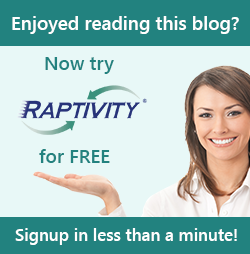 Probably many Raptivity users would know me as the Support Manager for Raptivity. Well, today I am wearing a different hat of a Raptivity Valued Professional (RVP) and will share my experience as one. This time, all the RVPs together had planned and announced a unique service called Raptivity Expert Hour. This service was dedicated exclusively for our Premium customers (i.e., customers with active support plan) and Himalaya customers (Customers who have purchased complete Raptivity package). Under this service, our customers could avail one hour of consultation from a team of Raptivity Valued Professionals. They could ask any questions they had, get issues resolved or even brainstorm creative ideas of using Raptivity, to address their interactivity needs and challenges. The main focus of these expert hour sessions was to show case how Raptivity could be used effectively and creatively in their day to day eLearning content creation. Many of our users availed this complimentary service in the three months’ duration of this program. As a RVP, I got the opportunity to talk to some of these customers and help them. Some of the customers were totally new to eLearning and Raptivity whereas some were themselves Raptivity Experts. Before the call, customers had shared their thoughts and issues with us through a pre-call survey. Many customers wanted to know how Raptivity interactivities could be used differently whereas few had queries on which interactions could be used for their specific content and so on. These points were taken up during the one hour sessions with them. To name some of them, once I showed how a very simple interaction model ‘Flash Card’ can be used differently to show a profit chart. I also took some customers through the Tin Can tracking mechanism of Raptivity. Various new features like media tool box, HTML5 publishing, global settings, etc were also show cased during the calls. Post the expert hour, some of our customers wrote back sharing their feedback for the session. One of the customer’s has shared- “I truly appreciated the time and the patience of the presenter. I really liked how he started the session, explaining how he would present for 5-6 minutes, then a question period, but he was still great at handling questions on the spot.” Customers also appreciated our continuous efforts to make them happy. Well, to be honest, nothing excites us as much as positive feedback and appreciation from our customers. It was really a great experience for me personally. I will look forward to conducting more such sessions in the future. If you have availed a Raptivity Expert Hour session, do share your experience through comments below. For any queries on Raptivity, write to us at info@raptivity.com.